Associated Press Notre Dame quarterback Brandon Wimbush throws against Michigan in the first half in South Bend tonight. SOUTH BEND – The Notre Dame football team secured a 24-17 victory over the Michigan Wolverines tonight. Michigan trailed 24-10 with five minutes left, but mounted a comeback in the waning minutes. The Wolverines went 80 yards in 2:49 for their first offensive touchdown of the game, which Karan Higdon punched in from two yards to bring the Wolverines within seven. The visitors got the ball back after Notre Dame went three-and-out, but Jerry Tillery forced a fumble on Shea Patterson and Te'von Coney scooped it up to seal a season-opening win. Notre Dame got the ball first and got off to about as good of a start as even the most die-hard fan could have imagined. The first two plays were suspect, with Michigan getting straight into the backfield, but the Irish offensive line settled in and dominated the rest of the drive. 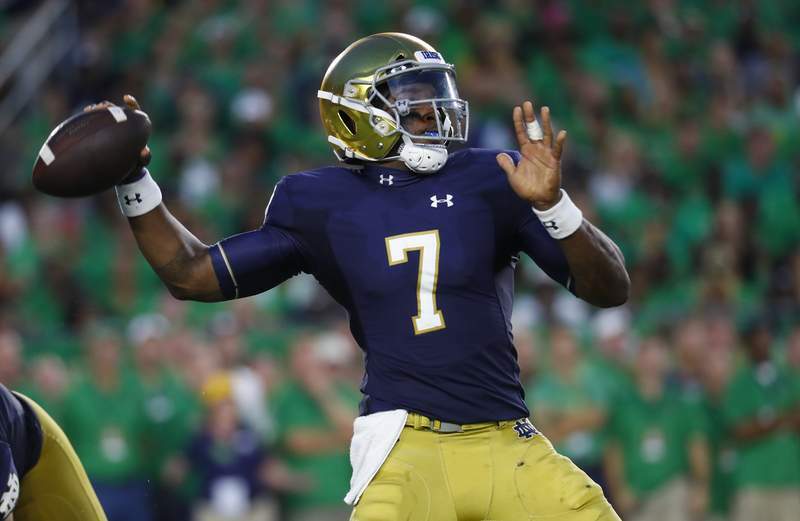 Brandon Wimbush connected with Miles Boykin for a 28-yard completion and freshman Jafar Armstrong took a read-option handoff from Ian Book and zigzagged 13 yards for a touchdown. The drive took just seven plays and traveled 75 yards in 1:25 to make it 7-0. Notre Dame's defense stuffed Michigan's inside run game on the Wolverines' opening drive and got the ball back for its offense, which again moved the ball with ease. Starting from their own 4, the Irish moved upfield on a leaping catch by tight end Alize Mack that went for 26 yards. Later in the drive, Wimbush dropped back from the Michigan 43 and found slot receiver Chris Finke deep down field between the corner and the safety. He lofted the ball into the end zone and Finke fought off a defender to come down with a magnificent catch for his first career touchdown. The 96-yard drive took just three minutes and put Notre Dame ahead 14-0. The next time the Irish scored, it was more methodical, eschewing the big play and instead settling for short and medium gains. Several times, Wimbush scrambled out of trouble for positive gains, frustrating a Michigan defense that couldn't get off the field. Once Notre Dame reached the red zone, it got some assistance from Wolverine defensive end Chase Winovich, who committed a blatant roughing the passer penalty on Wimbush and moved the ball inside the 5-yard-line. On the next play, Armstrong went around the left side and got the edge, scoring again to put the Irish in front 21-3. After that drive, which took 7:57 in the second quarter and went 75 yards in 15 plays, the Wolverines seemed to be on the brink of having the game get away from them. They got a huge spark on the next play, however, when Ambry Thomas took the kickoff 99 yards for a touchdown to bring his team back within 11. It was the first touchdown of his Michigan career and came at a crucial time. The opening of the second half was action-packed, but ultimately yielded no points. Michigan quarterback Shea Patterson found wide receiver Nico Collins wide open on the first play of the half for a 52-yard gain that would have been a touchdown had the ball been thrown a little further. Notre Dame's defense stiffened, however, and Michigan botched a field-goal attempt, coming away with nothing on the drive. Wimbush threw an interception on the ensuing drive, far overthrowing Chase Claypool on what looked like a miscommunication between quarterback and receiver. Michigan took over at midfield, but again couldn't move the ball. The Wolverines went for it on fourth down, but safety Alohi Gilman was in perfect position and the pass fell incomplete. Gilman, a transfer from Navy playing in his first game with the Irish, was all over the field in the secondary, knocking away a would-be touchdown pass in the first quarter and ending the aforementioned Michigan drive on fourth down with perfect coverage on a Wolverines tight end. He finished with seven tackles, including one for loss, and two pass breakups. Notre Dame is 106-17-5 in season-opening games and 26-6 in their last 32. ... The game was the fifth season-opening night game at Notre Dame Stadium and the Irish improved to 5-0 in such games. Four of those wins are against Michigan. ... The Wolverines are the winningest team in college football history while Notre Dame is third. ... Irish cornerback Julian Love set a Notre Dame record with 20 pass breakups in 2017, but didn't have any Saturday. ... Michigan outgained Notre Dame 307-302. ... Coney led the Irish with 10 tackles and added a hit on the quarterback in addition to his fumble recovery. ... Fort Wayne native Drue Tranquill had six tackles. ... Notre Dame held Michigan to 66 yards rushing on 32 carries, a 2.1-yard average per attempt. ... Patterson hurt his ankle early in the fourth quarter and redshirt freshman Dylan McCaffrey came in to play quarterback for two possessions. McCaffrey is the younger brother of former Heisman Trophy runner-up Christian McCaffrey. The Irish are back in action Saturday, Sept. 8 against Ball State (1-0) at Notre Dame Stadium. The game will kick off at 3:30 p.m. and will be broadcast on NBC. The Cardinals are coming off a 42-6 season-opening win against Central Connecticut State after finishing last season on a nine-game losing streak. The game will be the first for Notre Dame against an in-state opponent since it beat Purdue 30-14 in 2014.